Do you have a favorite blog? Of course you have several; and are perhaps even a blogger yourself. Have you ever wondered from time to time how they do it? Or does everything on your end of the screen seem so flawless your perspective on your own life gets a little fuzzy? Well I am here to tell you that blogging is not the perfection perceived- it is most often crazy hours, emails in the wee hours, and balancing on chairs in hallways to get the perfect light. There's a lot that goes on behind the scenes before that URL can hit the internet, and myself and a group of bloggers are here to give you the down and dirty secrets of #BloggerConfessions in a new weekly blog hop that invites you to confess on a new topic each week. Whether you're looking for a fun hop you can fill an organic content need with(yes, us bloggers worry about that), or are simply a reader looking for the juicy, and often hilarious, truth on blogging- you're invited. Bloggers, feel free to post your response to each week's topic any day of the week (Thursday is the feature day) and link up to the LINKY at the bottom of this post. Be sure to grab the button while you're here! Readers, sit back, relax, and prepare as we demystify blogging one dish at a time! Prompt: Okay, it's time to dish about that sponsored post, blog hop, complicated recipe, or just generally rocking post that almost didn't happen. We want to hear about computer mishaps, missed flights, Blogger mysteries and that time when your perfect post was much more of a quest to tackle than anyone could have ever known! The world of a blogger is fast and ever moving. Whether you're s humble coupons and giveaway blog, lifestyle blog, or the sort of online content generator that puts Martha Stewart to shame with flawlessly crafted sponsored content; blogging isn't a walk in the park ya'll. Even those of us, like myself, who stubbornly cling to antiquated Blogger systems (as opposed to Wordpress) in a desperate effort to avoid formatting, widgets, or any other form of technical blogging aspect. And yet, as bloggers, we are technical creatures. It's never as simple as snapping a cell phone pic and writing a paragraph or two. And tech, in fact is one of the modern blogger's (haha, modern?) biggest expenses. Not only do our keyboards, USB and SD slots, and coffee stained workstations stand up to a lot of abuse, but our cameras are most often put in precarious positions. Few things spell h-a-z-a-r-d to a blogger like working with our most viral of subjects; small children and pets. Naturally the hardest to keep still (photograph) and control in general are that which we find our honeypot images within. When I first began blogging I still remember having to learn 'that' lesson. After a good year of having my camera out and about with a strict 'no touch' rule, I became a little laxed in my repetition of this holy truth. Even the 4 year-old would mouth the words along as I pulled out my camera or simply set it down before leaving the room, "Do NOT touch the camera." So, one day, coming back out of the house after retrieving a screwdriver that had been previously undisclosed on the Little Tikes instructions, I was greeted with the look of shame. 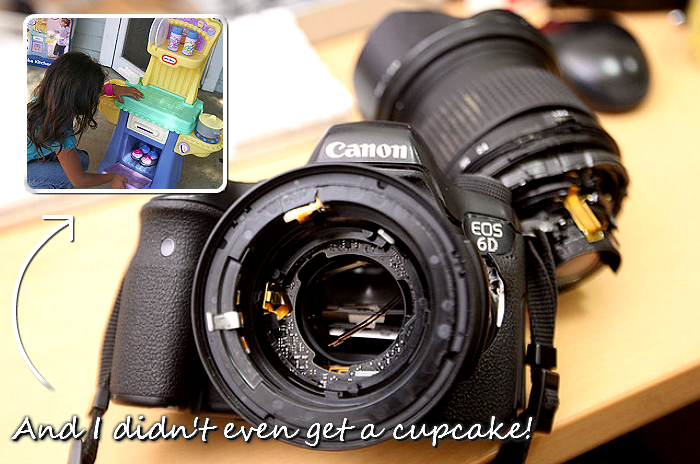 There, on the concrete next to the Cupcake Kitchen was my camera- in two pieces. My heart fell; at the time my budget simply couldn't allow for me to go out and buy a new camera. I looked from the shards of plastic and lens to the little girl with the quivering lip. In my head I kept repeating 'I told you not to touch it,' but my mouth remained silent, "I...I'm sorry, I didn't touch, I promise!" she sputtered, fighting tears. My mind traced back through time, recalling the steps of what had transpired just minutes back- she was right. I had left it on the toy; the toy we were building for her. She was merely trying to play with the awesome new shiny playset I had promised, and I had been the adult foolish to leave it standing on a plastic counter of death. While that day had been entirely my fault, and ultimately a blogger disaster turned cuddle session and impromptu cupcake party; not all mishaps are avoidable. Just recently I was rushing to complete my giveaway posts for the annual Blog POP! Events and Group Spring Fling hop and watched as my laptop keyboard quite literally began smoking. My fan had died and my keyboard was lighting up fast, beneath my very fingers! Luckily, I back up all my content to an external drive weekly, and was smart enough to turn it off immediately until I could safely pull my info in a cool location- but you really never know when tech will decide to break down! Let's just say I wasn't exactly planning on walking into Best Buy and buying a laptop that night! 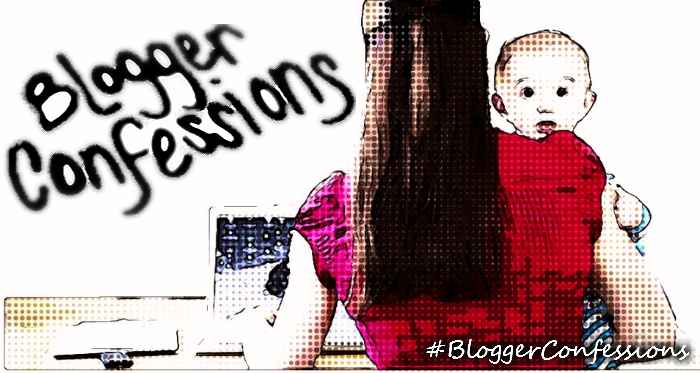 Link up your Blogger Nightmares #BloggerConfessions anytime between now and next Thursday! Prompt for Week 5: (8/21) Open Confession- Do you have something that you think nobody would ever suspect when reading your blog? Do you only take photos in a tutu? Can you only write when Mozart is playing? This is your free week to dish and confess- we promise, we won't judge! Oh my gosh. I literally gasped when I saw the camera. So, so sad. I would have cried myself! I totally feel you. Just a few months ago I was working and hubby looked at me and was like, um, I smell something burning. I jump up and realized that my laptop was smoking! What a nightmare! My computer fan is going out right now! I seem to run through cameras and computers faster than anyone else I know, although I have plenty of "help" from kids, cats, and my husband. This image of the camera sends chills down my spine! I would freak if my camera broke in two...FREAK!!!! You must have had some great composure! Oh the stories my laptop, camera and cell phone could tell! The turmoil those devices have been through lol. Oh I would have died. That is just heart breaking. Aw! My daughter is old enough to not break things, but yet my husband is super clumsy! We also have pets who have a tendency to knock things over! Yikes! My son has dropped my phone in the toilet, and it was a goner! I felt soo out of touch for the week until I could replace it. Oh no! Tears would have been shed by me for sure if that was my camera! I always cringe when my kids drop my phone! Oh my goodness, I would have had a heart-attack! 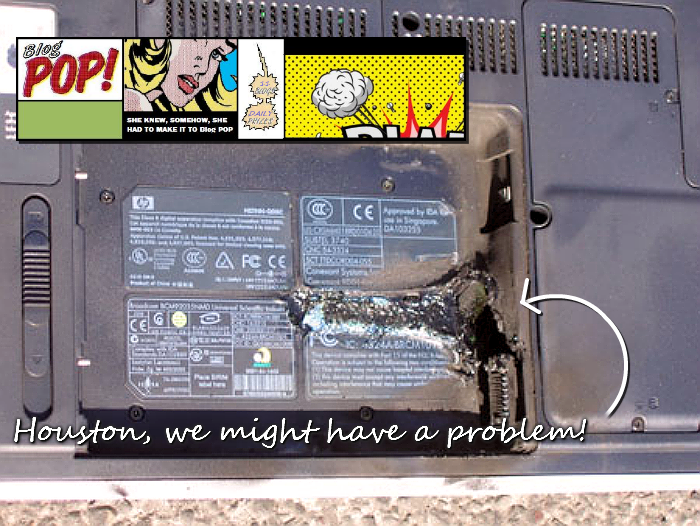 These things happen when we have kids, wonder if buying a new one or getting it fixed which would be a better option. Hmm, I can't think of anything at the top of my head but, I'm sure there's tons. That camera, oh no!